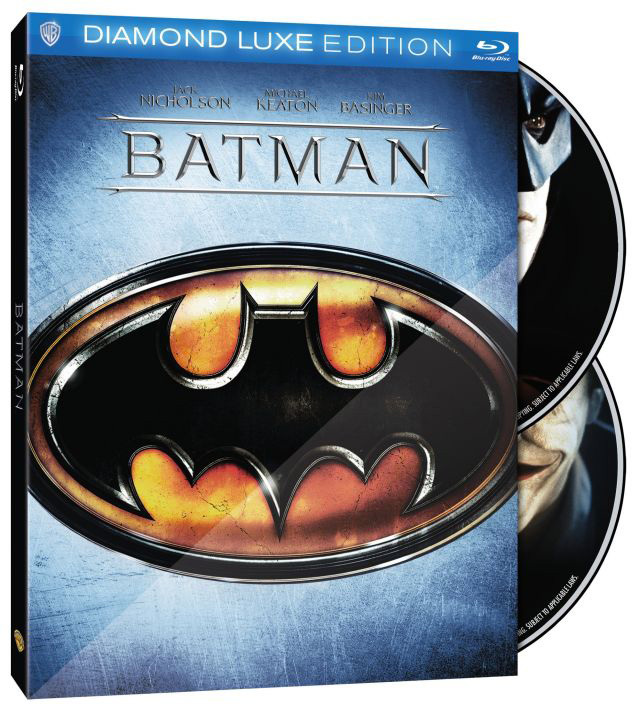 This November, to mark the 25th Anniversary of Batman (the one directed by Tim Burton in 1989), Warner Bros. Home Entertainment will release a new Blu-ray, the Batman 25th Anniversary Two-Disc Edition. List price is $24.98. They’re putting it in the “studio’s distinctive new sleek Diamond Luxe collector-style packaging” and adding a new documentary, “Batman: The Birth of the Modern Blockbuster”. That addition is promised to be “a look at the phenomenal marketing, extensive merchandising, and franchise foresight that set the template for the next 25 years of tentpole pictures.” In other words, we wouldn’t have the successful blockbusters we do now without this film, starring Michael Keaton as Bruce Wayne/Batman, Jack Nicholson as the Joker, and Kim Basinger as V-V-Vicki Vale. It’s an Oscar winner, too, for Best Art Direction/Set Decoration (Anton Furst and Peter Young).